A well-worn techie cliché asserts the best camera is the one you've got with you, and that usually means the smartphone sitting in your pocket. Not so fast. Sony just pulled back the curtain on its latest pocket-friendly camera -- the RX100 IV -- and it's basically the point-and-shoot to end all point-and-shoots. Just know that you'll have to shell out some serious cash for the privilege: This thing'll hit store shelves in July for a hefty $969. If you've fiddled around with Sony's pint-size RX shooters before, you won't find any dramatic design changes; the RX100 is a still a tiny, dark aluminum box with a 24-70mm f/1.8 lens that leaps out with gusto when you turn the thing on. It's plenty light and squeezes into even a tight pair of jeans without trouble, just watch out for the lens' telltale bulge. Really though, you're not buying this thing for its looks. Sony drew at least a little inspiration from smartphones when it plopped a 1-inch, stacked CMOS sensor setup into this thing -- it allows for smaller camera bodies (not that the Mk.IV is tinier than its predecessor) and captures photos at resolutions up to 16.8 megapixels. 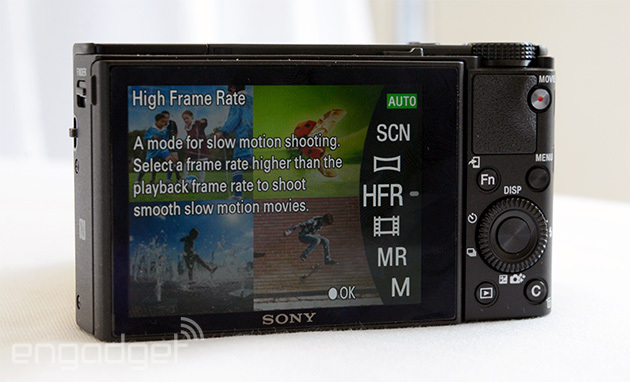 Now, I've been referring to this thing as a point-and-shoot, but that's a comparison based more on size and shape than it is on performance; you won't find another pocketable camera that can shoot with shutter speeds as quick as 1/32,000th of a second. The shutter action is oddly quiet too (especially to a guy who does 95 percent of his shooting on an SLR), which Sony seems proud of. Your next barbecue won't sound like a paparazzi war zone. The whole thing feels tight and snappy, too, thanks to the internals -- whipping through menus was quick if a little unintuitive, and more importantly, there was basically no downtime between photos. So yeah, it'll fit in your clothes and takes photos that'd make your phone cry (had some macabre device maker kitted it out with tear ducts). The really neat stuff comes into play once you start using the thing as a video camera. Sony claims it'll shoot near-broadcast-quality 4K video for five minutes at a time, and can record slow-motion video at up to 960 frames per second. This is the part where I wanted to dump a gallery of test photos or slo-mo video taken with the Mk. IV, but -- surprise, surprise -- Sony was having none of that. Still, seeing exactly how a bald, sleight-of-hand artist pulled off his card tricks in startlingly crisp slow motion was probably the highlight of my morning. The rest of us might have written off tiny cameras that aren't smartphones, but Sony's sensor and design chops argue pretty strongly that we've been too hasty. Obviously, there's still plenty more to dig into here and I've had all of a half hour to play with the thing -- stay tuned for more nuanced impressions once we get a little more review time in.